Can a photograph capture the sensation of a warm spring breeze or the smell of freshly fallen snow? 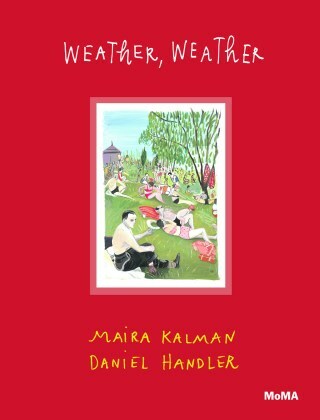 Weather, Weather, the third volume in a series of creative collaborations between renowned artist and bestselling author Maira Kalman, New York Times bestselling author Daniel Handler (aka Lemony Snicket), and The Museum of Modern Art, New York, is an evocative exploration of the physical environments captured in photographs from around the world. From the rainy streets of Paris to a sun-dappled pool in Beverly Hills, from steamy summer sidewalks in Brooklyn to snow-covered fields in Japan, the photographs depict much more than what first meets the eye. Featuring vibrant new paintings by Kalman, inspired by these photographs and the poetic prose by Handler that bring the images to life, Weather, Weather is a tender reflection on the passing of seasons, perspective, and memory.